Notes: Does God Have a Nature? When we say that God is good or that he is all-powerful we are predicating something of a subject as we are when we say “Socrates is wise.” On a realist view, the predicate is a property that is instantiated by the particular. “Wise” is a property of Socrates and, as such, and given realism, the property of is what is referred to by the term “wise.” To say that God is wise, or good is to say that God has the property of wisdom or goodness. If there are such things, as realists suggest, then they must exist in order to be referred to. In common parlance, such things are called universals. They are eternally existent abstract objects. Properties should be distinguished from kinds and relations. Kinds are categories that entities belong to, whereas properties are things that are had by entities. Relations are exemplified by multiple entities in relation to one another such as being taller than or far from. The problem of coherence facing any account of God’s properties is this: If properties are eternally existing entities, perhaps even existing necessarily and, if nothing that exists apart from God exists outside of God’s control, then in what sense are properties under God’s control? Surely if they are necessarily existing things, then there is nothing God can do about them. On the other hand, if God has control over them, then they could have been otherwise. But then what would it mean to say that God has any of these properties essentially? For to say that he has a property essentially is to say that if he didn’t have it, he wouldn’t be God. There are numerous proposed solutions to this problem. Here are a few: First, and most traditionally, one might say that God’s properties are identical to God’s nature. Whereas you and I have properties, God is identical to his properties. This is called the simplicity doctrine. It is supposed that if God is identical with his properties then he neither has to created them nor are they independent of God. This view was held by Aquinas. Another way to solve the problem would be to say that there are no such things as properties. Properties are useful fictions by which we mean merely something true about a particular thing. To say that God is wise is to say that it is true that God is wise. There need be no actual referent implied by the predicate. So, an entity, E, has a certain property, P, essentially iff it is necessarily true that E is P. So, rather than deciding whether or not God has the property of wisdom essentially and whether there is such a thing as wisdom to be had, one should parse out essentialism as equivalent to a necessary truth: “God is wise” is true in all possible worlds. Plantinga points out that this won’t do the trick. For what is true of properties is true of truths. If it is necessarily true that God is wise, then it could not have been otherwise. But then there is something that God has no control over. He does not get to decide on what is true or not. If he does get to decide, then “God is wise” is not necessarily true. If one were to reply that it is true in virtue of the nature of God and God exists in all possible worlds, then we are back to thinking of essentialism in terms of essential properties. Perhaps, then, God could have been other than what he is. He could have decided on another set of properties altogether but did not. Though this is possible, we should not be concerned since God is who he is even though it is possible that he be something else. To say this is to say that no properties are necessary even though they are eternal. Perhaps only eternal properties are what we need. 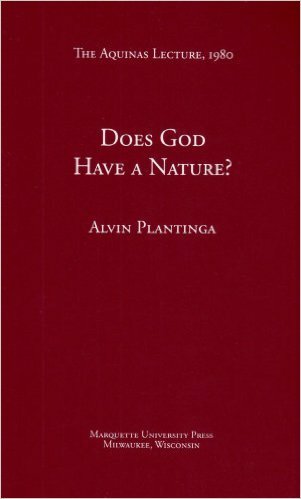 Alvin Plantinga, Does God Have a Nature? (Milwaukee: Marquette University Press, 2007).